Scottsdale – Golden Waters, a temporary light installation by artist Grimanesa Amorós that will extend from the famous Soleri Bridge, will be on view June 10-September 30, 2015. 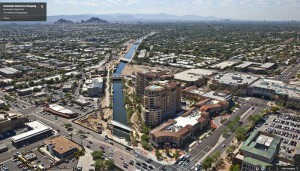 Scottsdale Public Art, a leader of defining art in the public realm, is the sponsor of the installation. 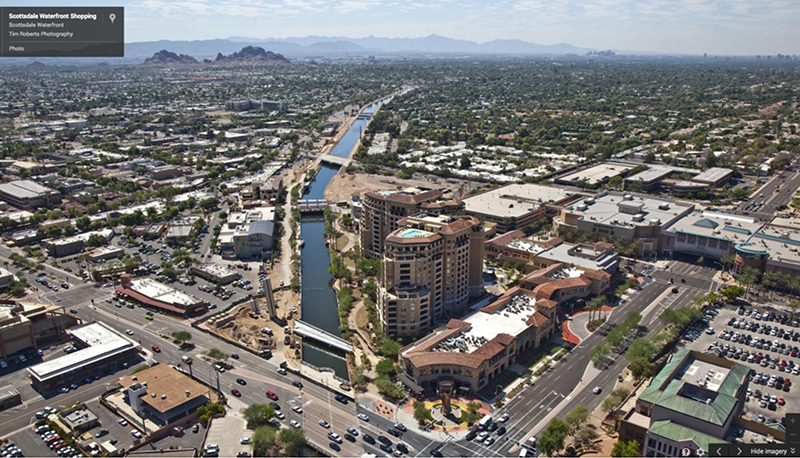 Inspired by and reflecting the natural elegance of the Arizona canal, a nearly fifty mile long body of water that runs through Scottsdale, Golden Waters will be mounted on a secure structure attached to the bridge, designed by artist, architect and philosopher Paolo Soleri. The hovering light sculpture will extend parallel to the canal channel eighty feet west of the bridge. Golden Waters’ LED tubing system will appear to rise from the canal waters below, celebrating the union of light and water. The vertical and horizontal lines of the installation are a metaphor for the dynamic balance between urban and natural forces that can be experienced simultaneously. Golden Waters hopes to engage the viewer by emphasizing a unique perspective on nature and landscape. On June 19th, you can meet and greet the artist at the Soleri Bridge at 6:30pm – 8:30pm. For event updates, visit ScottsdalePublicArt.org/Events.